Lanzarote has a lunar landscape , unique, and the distances between the centers and tourist and wild beaches for surfing , kite surfing and SUP are minimal ... For this wherever you are, in a very short time you can reach Famara ( typical pueblo of fishermen and surfers) The apart- hotels in Costa Teguise or Puerto del Carmen, the houses , the Surf House or Bungalow Famara are available throughout the year. The Surf house or Kite House in Famara is ideal for those travelling alone or would like to meet other people while on vacation and share experiences and emotions with people from all over the world. We also offer private rooms for couples and groups who wish to be together during their surf trip or Kite trip. It is a large and spacious house with three floors, an outer space for washing wetsuits, boards and accessories, big living area, kitchen and eating area, three bedrooms , the first which sleeps 6, the second 2nd and 3rd sleep 2 to 3 people. 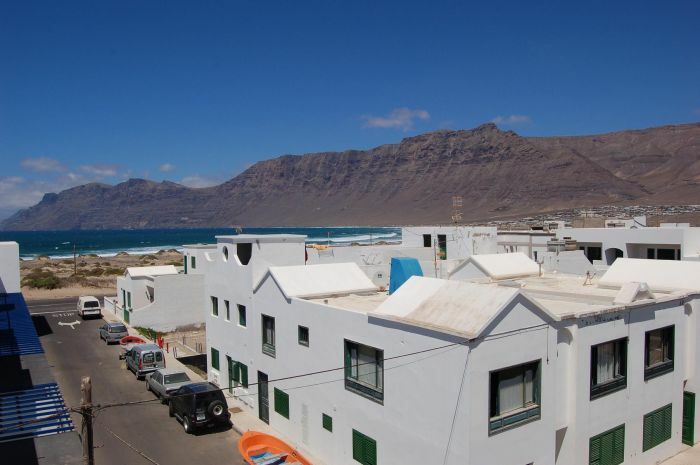 Famara offers a wide variety of accommodation to rent, bungalows with sea views, apartments, studios, surf-house etc…. If you are interested in spending your holiday in one of the most beautiful places in Europe and prasctice sport at a level you never imagine, please don't esitate to contact us at Lanzarote kite and we'll provide with all the photos and details about accomodations in the village. Puerto del Carmen is the ideal place for families with children or young people who wish to enjoy apart from water sports a little bit of night life and a variety of different restaurants to choose from. The beach in this part is very quiet and safe, Puerto del Carmen offers a big variety of places and activities but our water sports are usually always held Caleta de Famara, Surf, Kite and SUP.